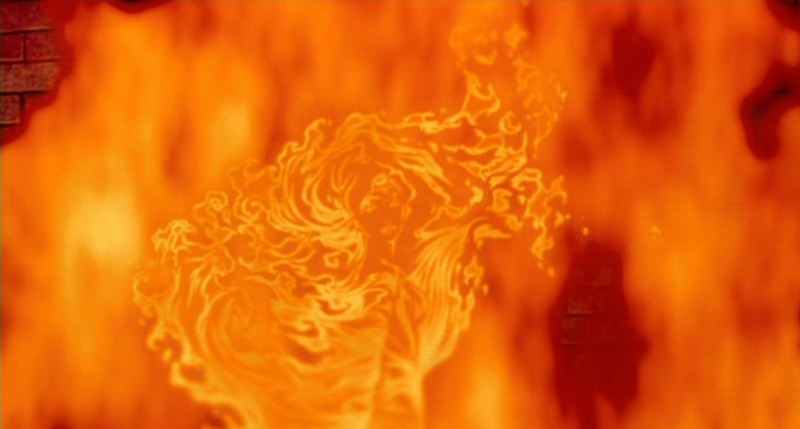 Hellfire is Heaven’s Light’s foil in every possible way. 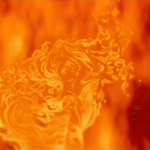 Heaven’s Light is a sweet hopeful ballad with some subtle humor in the visualization but Hellfire is an intense villain song that has a breaks down into insanity. 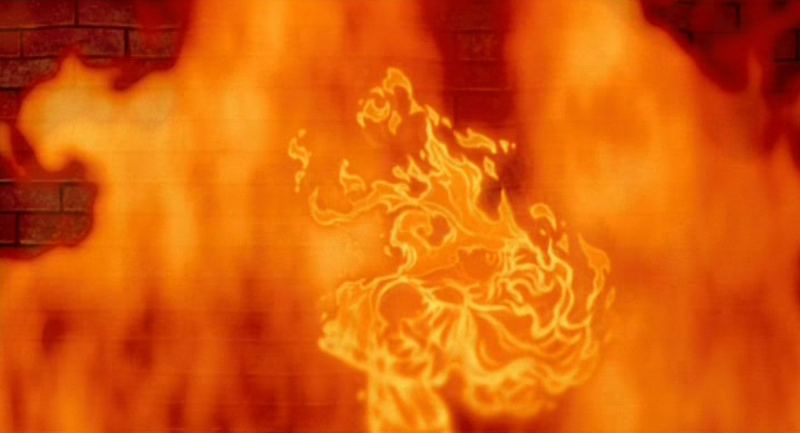 Hellfire is a villain song, but it’s not just any villain song, it’s “THE” villain song. 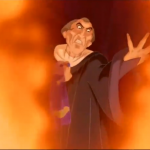 Many people consider it the best and one of the darkest Disney villain songs. 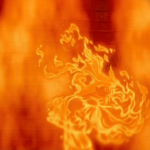 So what makes this song so good and dark? 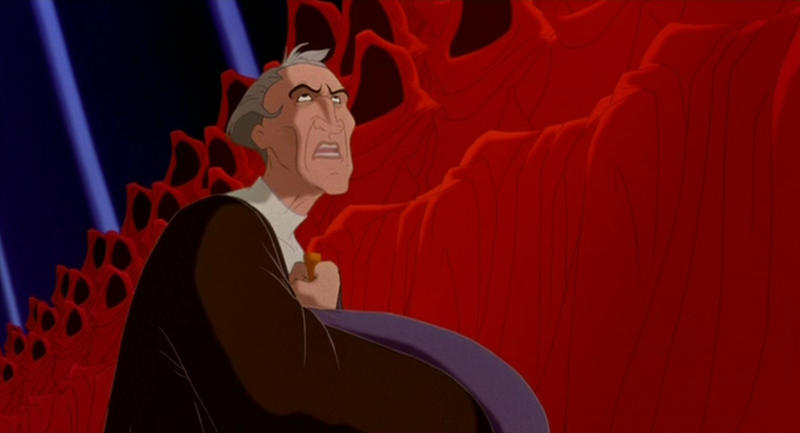 The song starts with Frollo singing to Notre Dame both figuratively and actually ( The building and the Virgin). 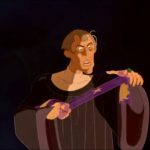 He claims that he’s purer than the common people and still as pure as he is, he can’t understand his obsession for Esmeralda and why she is invading his mind. 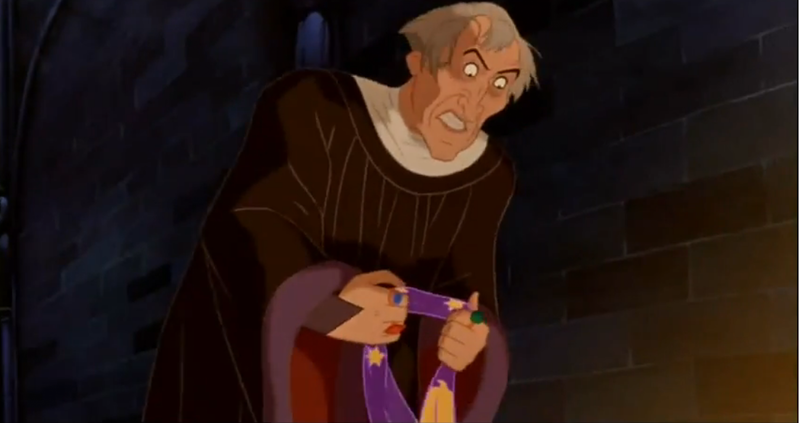 For Frollo this lust is not in conflict with ethics or his own deep religious convictions; it’s all about pride and fearing losing control within himself. 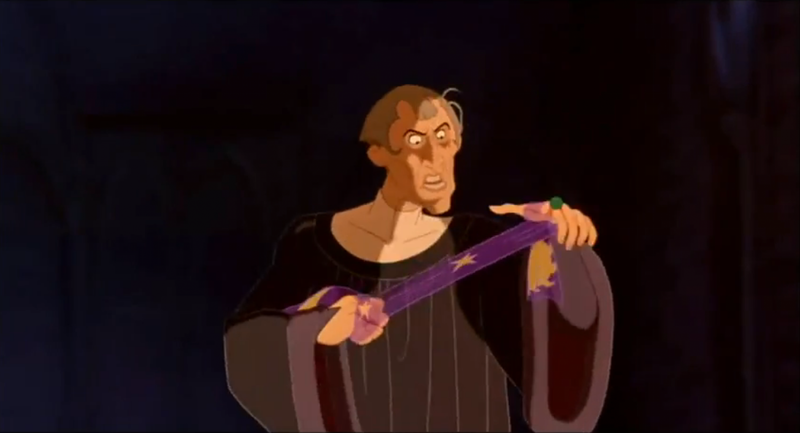 You can see him visually losing of control: he starts calm and become more and more crazy as the song progresses. 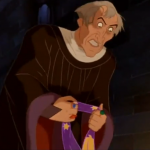 For Frollo there are two ways to resolve his problem, either Esmerlada must die or she must be his. 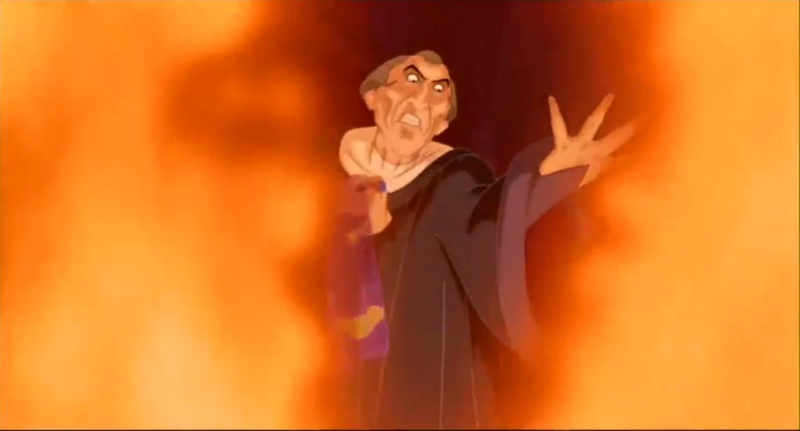 Hellfire has a very similar vibe to Frollo in the book. 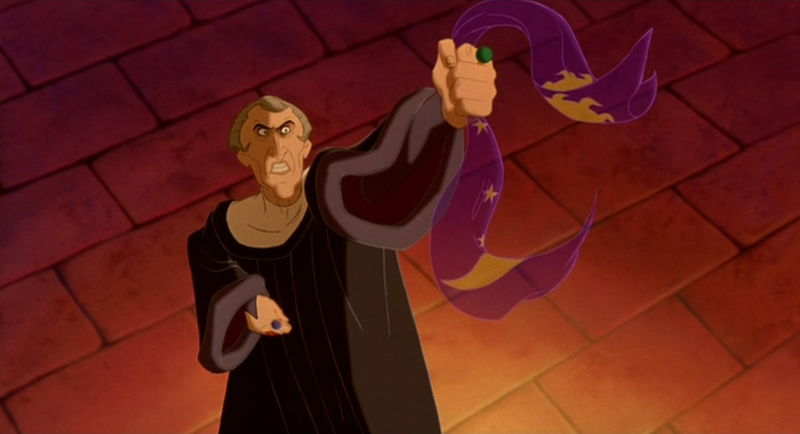 Victor Hugo’s Frollo was very proud of his purity. 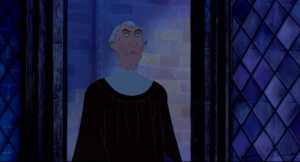 But much like Disney Frollo Hugo’s Frollo felt that Esmeralda was sent by hell to take him away. Unlike Disney Frollo, Hugo’s Frollo is more of a stalker who is hopelessly seeking out Esmeralda. He doesn’t really want her to die but doesn’t want her to be with anyway else. 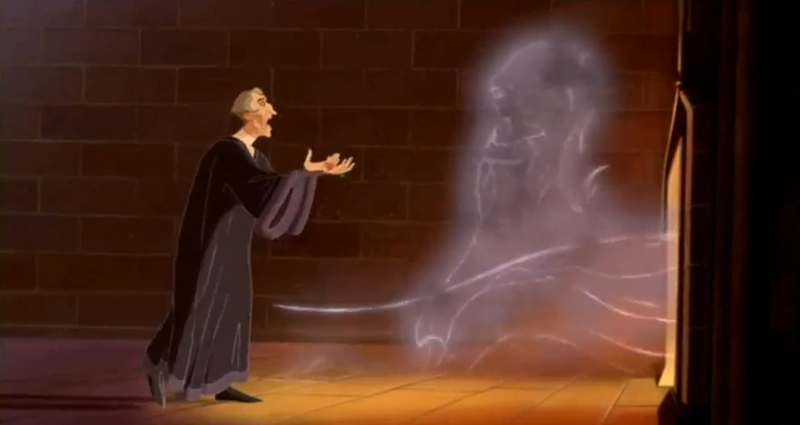 Disney’s Frollo is more black and white, either she is his or she dies, he only going to ask once. 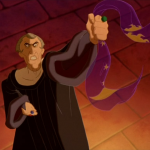 Frollo in Hellfire does have a twinge of gray (which you’ll never seen again), he asks for God to have mercy on both him and Esmeralda. 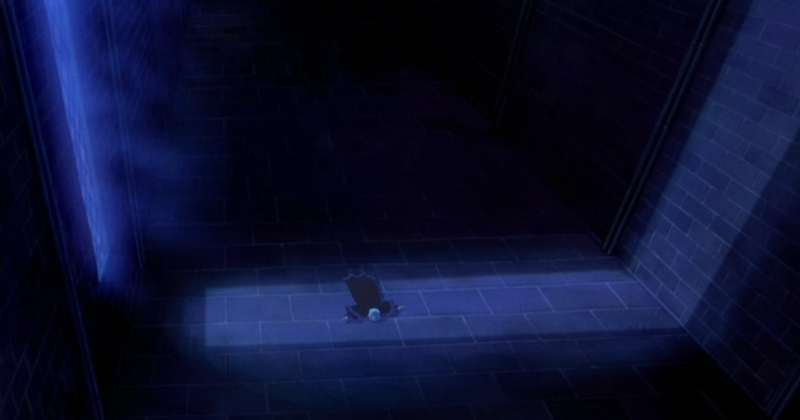 If as he knows he’s wrong but he won’t do anything about it because he too far gone. 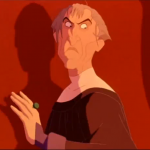 The Latin chanted “Mea Culpa” (Through my fault) also drives that point too. 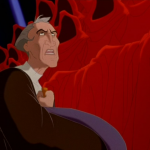 It’s an odd Disney Villain song as Frollo isn’t revealing in his evilness or what his brilliant evil plans are, he is simply singing out his desperation which ultimately gets worse. 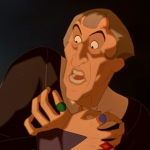 Unlike other songs, Frollo is not singing to anyone, usually a villain is rubbing something in the hero’s face, being a demagogue, or exposing their master plan of evil to minions. 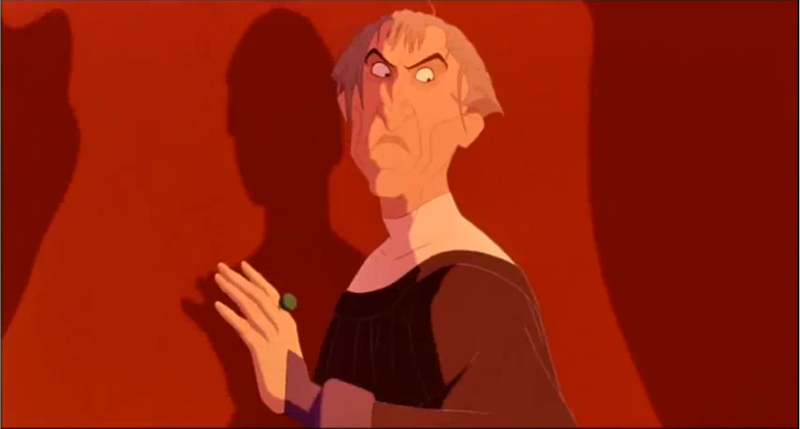 Frollo is singing to himself. 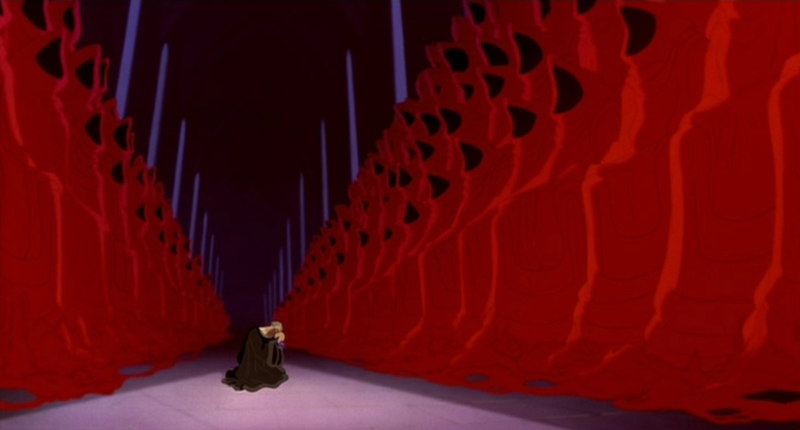 It reminds me of La Monture. 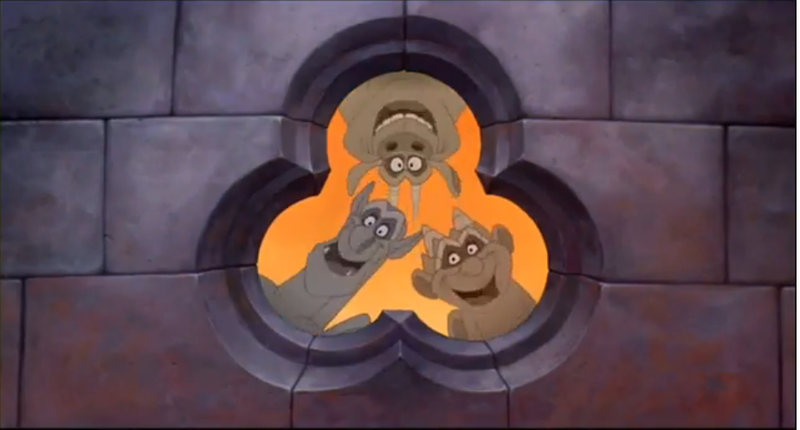 In the original staging in Notre Dame de Paris, where Fleur de Lys (Phoebus’ fiancee) is singing about her desperation for Esmeralda to be hanged. 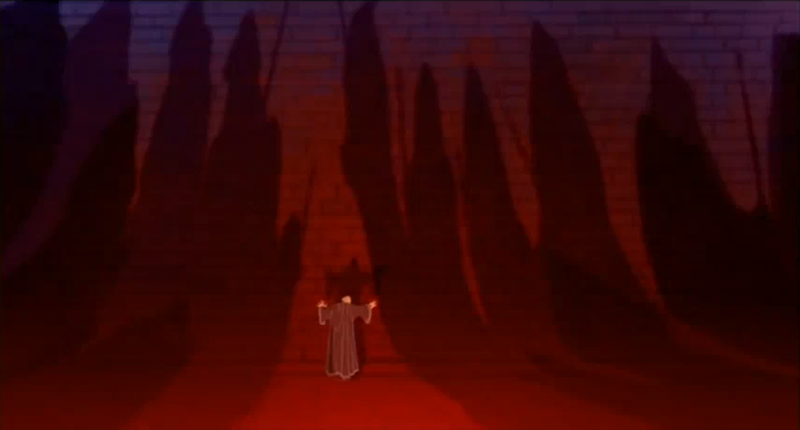 In the original staging, she singing to her shadow. 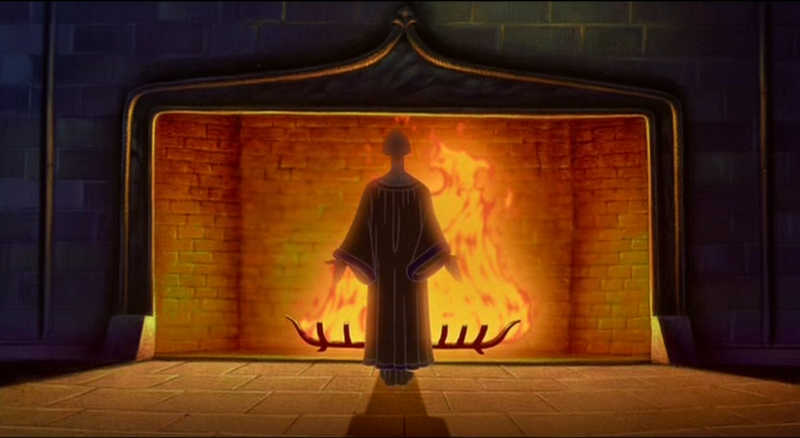 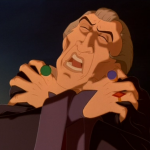 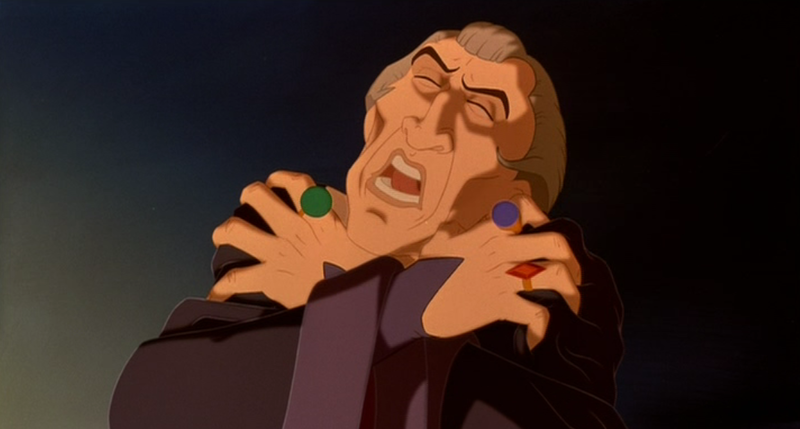 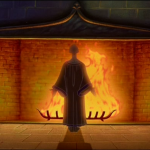 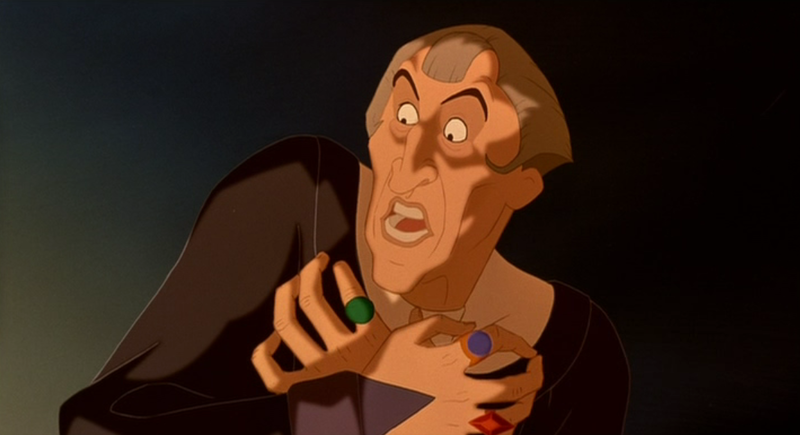 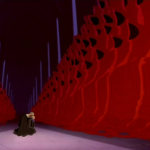 In singing alone Frollo’s feelings come off more intense, power, and frantic while he sings to the fireplace while seeing illusions and the becomes engulfed in specters. 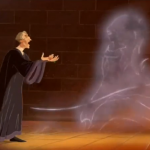 The song is perfectly sung by Tony Jay, he showcases control and then goes intense. 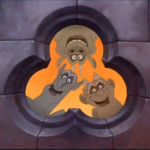 The Latin chanting is great mood enhancer. 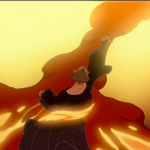 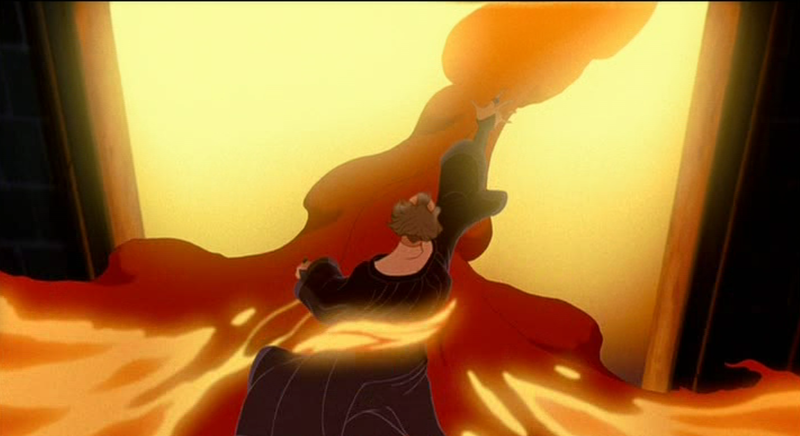 The music is intense and the Hellfire melody makes up a lot of the Hunchback of Notre Dame’s score. 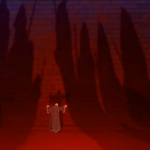 The Music was inspired by Mozart’s Requiem Mass which completes the dark presentation of the song.